3 Ground floor plan showing library and surrounding offices. 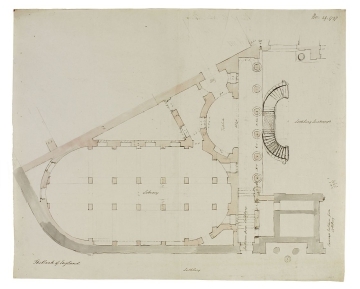 On 14 November 1797 a revised design for the library was approved. It showed a different arrangement of the library and adjoining vestibule. Drawing 3 shows these changes in comparison to drawing 2. The library is larger and resituated parallel to Lothbury Street. The semicircular vestibule adjacent to the library has been diminished. The design still consists of a building with semicircular ends, as in drawing 2, but it is elongated and is shown with supporting piers. The east side of the Court is also shown, designed as a portico of six columns with a double external staircase on a curved plan added in Soane's hand.